My first attempt to record an Expert Interview podcast with Wilfred Emmanuel-Jones was over Skype, and technical glitches got the better of us. This turned out to be a good thing, as it led us to meet in person at the entrepreneur’s apartment overlooking the River Thames in London. I’d met Emmanuel-Jones briefly a few years earlier, when he was giving a motivational speech at a corporate event. He delivered a powerful message about the power of reaching for your dreams, conveyed through his own personal story of overcoming adversity and succeeding against all odds. Seated in his riverside apartment, with an audience of one, he displayed the same focus and passion. This time he was talking about his new book, “Jeopardy: The Danger of Playing It Safe on the Path to Success,” which crystalizes his rallying cry into a series of tips, each explored in its own chapter. Some of these chapters have provocative titles, like “Get an Attitude Problem” and “Stop Surviving.” The first chapter, “Embrace Jeopardy,” sets out Emmanuel-Jones’ motivation for writing the book. 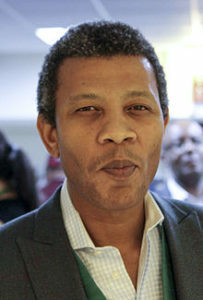 His book aims to “give people ideas and examples of what they need to do to overcome uncertainty.” it does this by sharing what Emmanuel-Jones has learned through his own life’s journey, which saw him transform from “a boy from society’s dustbin heap” to the founder of a popular food brand with a turnover of several million pounds. “Making a friend of fear” is central to his approach. He recognizes that, at times, fear can be helpful – for example, when it makes you run from life-threatening situations. But it can also undermine our attempts to take a leap into the unknown and, conceivably, a better future. Facing death brought a new kind of fear for Emmanuel-Jones, and consequently a new opportunity to reflect and learn. Which brings us to the importance of holding onto your dreams. A number of dreams powered Emmanuel-Jones’s own career, taking him from the army, to working in kitchens, to the BBC, where he produced and directed documentaries, and from there to the world of PR, where he built and promoted several household brand names. But his biggest and most enduring dream was to become a farmer. In this clip from our Expert Interview podcast, he relates how he achieved that ambition, buying a farm in the English county of Devon and building his successful company on the back of it. How much do you embrace jeopardy in your life and work? Join the discussion, below!